I've been trying to find a neat way to avoid peeling the lid off my IIe every time I want to add a few more floppy images to the CFFA card. 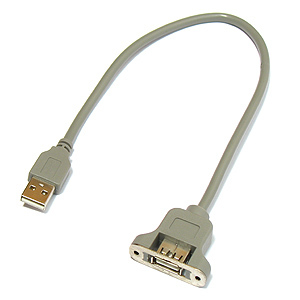 I recently found some inexpensiev USB extension cables where the female end terminates in a flush mount, and thought some others here might find them similarly useful. While it doesn't fit perfectly in any of the cutouts at the back of the computer, but does fit securely in the DB25 holes with the assistance of a pair of small washers and screws. Goldmine-Electronics are currently selling them at $1 each. This is good information to have -- thanks! I tried using the USB extension cable that came with my USB wireless NIC and it did not work at all. I picked up a generic USB extension cable from Big Lots (of all places) and it works great. Neither of the 4gb USB sticks I have work with the CFFA3000 but the 32gb HP stick I have does, so I just use that. Overkill, perhaps, but they're cheap enough these days.